Autumn has arrived! The trees are showing signs of it with the leaves starting to turn colors. It is a beautiful, sunny day here in Michigan. Our horses and pony are all being reshod by Leander, a man from our church district. Verena and I were glad for his help getting in one of the steers that escaped through the fence. We discovered the battery on the solar powered fence charger was dead. It seems that one steer always knows when the battery is dead. It always takes the same route to go through the gate and has to make several laps in my garden. After it does that, he will stand there and stare at us. Needless to say, I will be glad when he will be our meat in the freezer this winter. He has sure caused enough trouble getting through that fence more than once. We chased him out into the pasture field with our milk cow Bessie, since he didn’t want to go back to the field he came through. The boys can have the fun of getting him back to his field after they come home. The children are leaving every night again this week for German classes. It sure is quiet at nights. They eat before they go, but are always ready for popcorn or some kind of snack when they arrive back home. 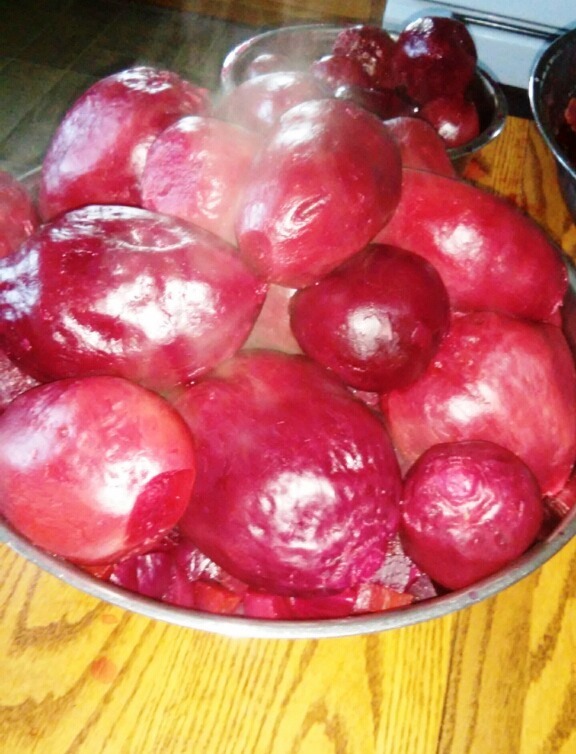 Prepping the beets for canning. Daughter Susan received a traveling journal from a friend in Ohio. Almost four years ago a girl from Shreve, Ohio, started this journal and sent it to another girl. Every girl writes about their family and life and sends it to another girl around the same age. This journal is very interesting and has traveled to many states such as Ohio, Indiana, Iowa, Kentucky, Michigan, Pennsylvania, Wisconsin, Maryland, Delaware, Minnesota, Missouri, Illinois, Nebraska, Kansas, and New York. Within some of those states, it traveled to quite a few different Amish communities. Very fascinating! 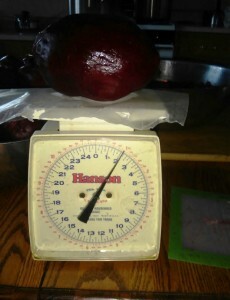 This beet weighed two pounds! A Joe-size beet — which he loves! 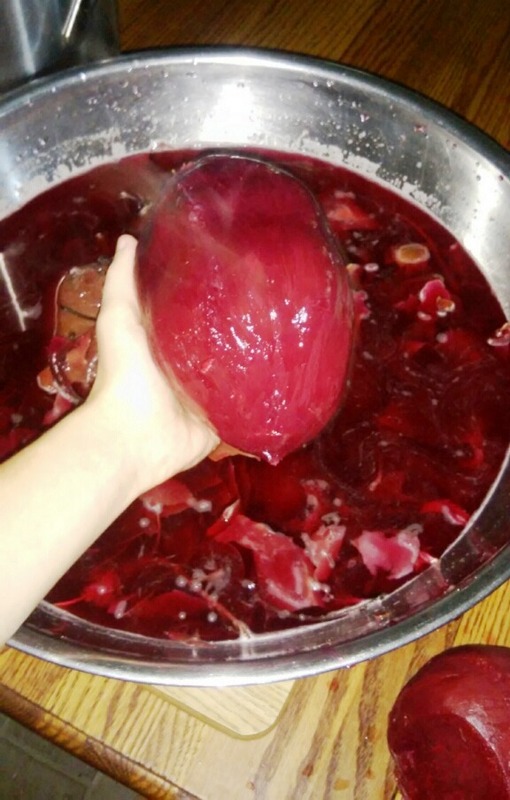 The girls and I want to go pull all the red beets in the garden this afternoon. We will make and can pickled red beets using them. I also like to fix cooked buttered beets, but Joe and I are the only ones that seem to eat those. I hope we will have time on Saturday to start cleaning up the garden. It looks like most of the plants are almost done producing anything. On Saturday, Joe and I and some of our children attended the local consignment auction. Daughters Susan, Verena, and Lovina went shopping elsewhere with daughter Elizabeth. Sounds like they had a lot of fun together. Son Benjamin went to try his luck for the youth hunting day, using bow and arrow. He missed a doe and was a little disappointed. I’ve had requests from readers for a granola recipe. I’ll share my niece Susan’s recipe for granola cereal. Enjoy! Combine all ingredients in large roaster. Bake at 300 degrees until golden, stirring every 10-15 minutes.